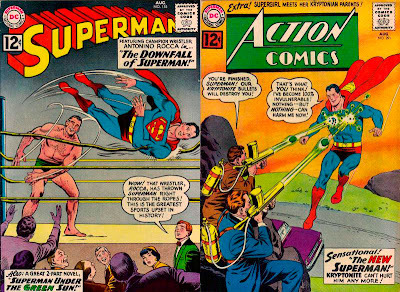 Superman 155 & Action Comics 291! SUPERMAN 155, August 1962, was published around June 21, 1962. It contained 32 pages for the cover price of 12¢. The editor was Mort Weisinger, and the cover was pencilled by Curt Swan and, according to Mike's Amazing World Of DC Comics, inked by Sheldon Moldoff, featuring the issue's second and final story. According to the Grand Comic Book Database, it lists the inker as John Forte. Both stories in this issue have been reprinted in SHOWCASE PRESENTS: SUPERMAN vol. III. - SUPERMAN UNDER THE GREEN SUN (9 pgs. ), written by Bill Finger according to SHOWCASE PRESENTS: SUPERMAN vol. III and the Grand Comic Book Database (which credits Finger as the writer of both parts of this story). Mike's Amazing World Of DC Comics and The Comic Book Database lists the writer as Edmond Hamilton. ComicbookDB also credits Mort Weisinger as co-writer for both parts of this story. - The 8 page Part II was titled The Blind Superman, written by Jerry Siegel, according to SHOWCASE PRESENTS: SUPERMAN vol. III. Because of the disagreement about the writer credit for this story, I did not count this story toward Jerry Siegel's total silver age comic book story writing credit. Mike's Amazing World Of DC Comics did not list a writer. The art team was penciller Wayne Boring and inker Stan Kaye. - THE DOWNFALL OF SUPERMAN (8 pgs. ), was written by Jerry Siegel, according to SHOWCASE PRESENTS: SUPERMAN vol. III and the Grand Comic Book Database. This story was Siegel's 42nd Superman story, and his 114th overall for the era. 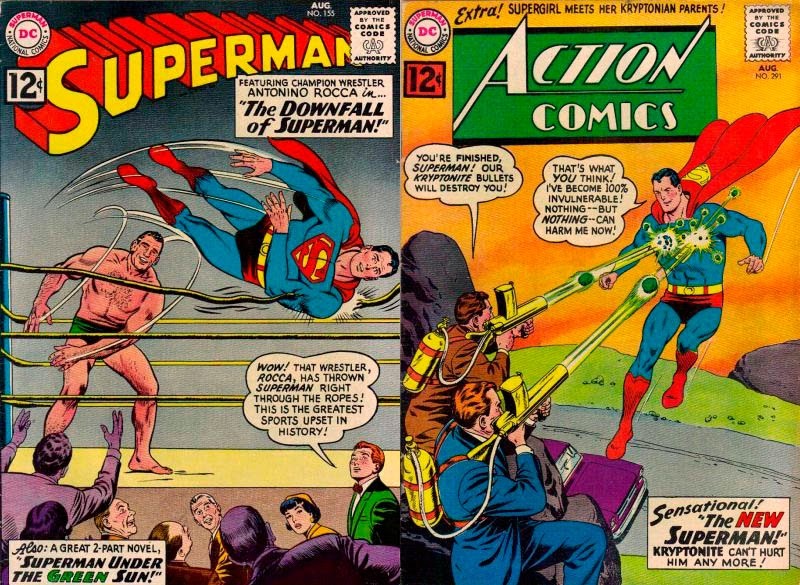 Curt Swan was the penciller and George Klein was the inker. ACTION COMICS 291, August 1962, was published on June 28, 1962. It contained 32 pages for the cover price of 12¢. Mort Weisinger was the editor, and the cover was pencilled by Curt Swan and inked by Stan Kaye. This cover also served as the cover for SHOWCASE PRESENTS: SUPERMAN vol. III, where it was reprinted. - The 12 page Superman story was titled THE NEW SUPERMAN, written by Robert Bernstein and drawn by Al Plastino. - The 12 page Supergirl story was titled THE BRIDE OF MR. MXYZPTLK, written by Jerry Siegel and drawn by Jim Mooney, and was reprinted in SHOWCASE PRESENTS: SUPERGIRL vol. II. This story was Siegel's 73rd silver age Superman Family story, and his 115th overall for the era. Elsewhere in DC Comics, 30 titles carried the August or August/September 1962 cover date. Because of my changing work schedule, I'm going to change my episode schedule. In order to cut down on the prep time for each episode, for now, I will cover only one comic book issue per episode. For months with more than one Superman title, I will cover the other Superman title for that particular month in the next episode. Next Episode: SUPERMAN FAMILY COMIC BOOKS COVER DATED OCTOBER 1959 PART I: SUPERMAN'S GIRL FRIEND LOIS LANE 12! In 2 weeks: SUPERMAN FAMILY COMIC BOOKS COVER DATED OCTOBER 1959 PART II: SUPERMAN'S PAL JIMMY OLSEN 40! In 3 Weeks: SUPERMAN COMIC BOOK COVER DATED SEPTEMBER 1962: ACTION COMICS 292! In 4 Weeks: SUPERMAN FAMILY COMIC BOOK COVER DATED NOVEMBER 1959: SUPERMAN'S GIRL FRIEND LOIS LANE 13!